This post is one of my faves from the last days of An Austin Homestead. I miss those lovely ochre walls, sigh. 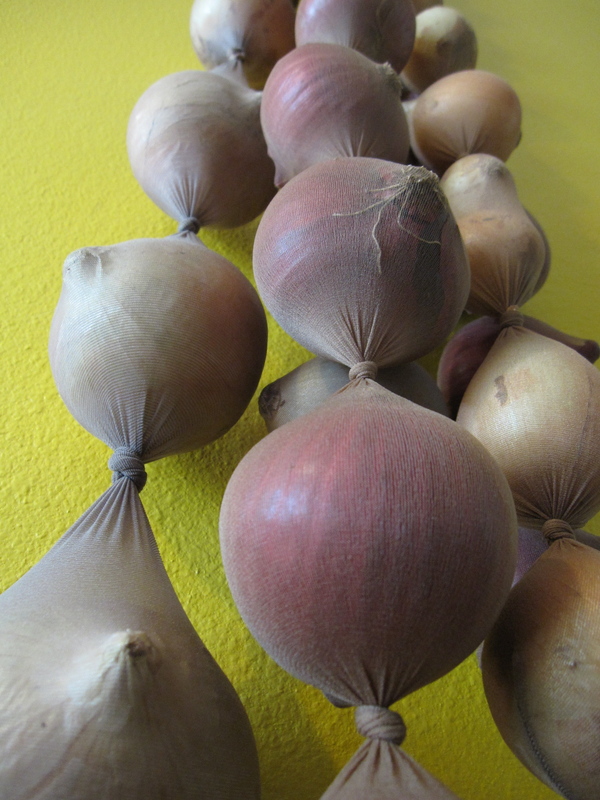 Storing onions in pantyhose is a great way to affordably pack up your onions to prevent them from molding. Pantyhose can be spendy – so watch for sales and check your local thrift stores for cheaper options. I had these pantyhose on hand for felting and for supporting my husband’s gourd fruits in the backyard. My friends thought my hanging onions look a bit like a modern art piece. I tend to agree. It took me at least 15 minutes or more to pack up all these onions, which is much less time than braiding and makes for pretty sturdy parcels. It looks really cool, and using the onions is convenient: clip off the bottom onion and the next is still knotted in. I also crochet cool produce bags that work well, but the more contact the onions have with each other the greater the risk of rot. 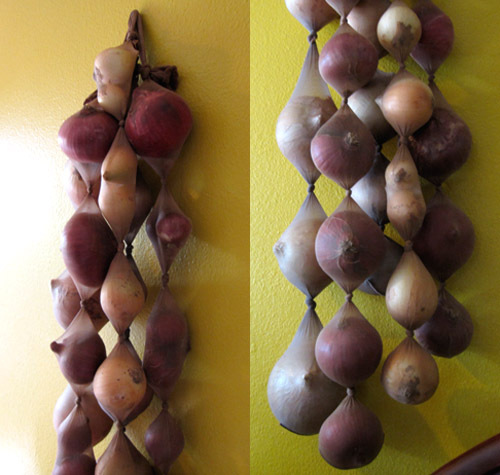 A root cellar would be nice, but wouldn’t a dark, cool hallway look awesome lined with some of these hanging onions? Some of the sweet onions are already getting mushy, so i set those aside in the fridge and will use the rest of the sweets first. The reds should store a fairly long time. I’m notorious for planting onions and forgetting what variety and how long they’re to be stored, so next onion planting season (which will hopefully be of a huge crop of onions) i’ll be sure and write down all the information on each variety planted: maturity date and storage time so that i know which onions to cure and store and which to pile joyfully into my face right away. Now, i’m not at all sure where i’ll be storing these guys en route: i’ll need a coolish place so they’ll probably ride in the cabin of the moving van or somewhere in the car that’s driving. ** Oregon update** These onions lasted the trip great! I hung them around our camping site, brought them in from the car on hot nights and they arrived to Oregon safely. In fact, i was using these onions for almost a YEAR after our arrival! Check out this ridiculous picture from last June during our move. What’s your favorite method of storing onions? Have you ever tried pantyhose? 4 Responses to Storing Onions using Pantyhose! hi there! Sorry for the delayed reply – yes, certainly! Use away (with a link back)! I’ve been reading around about storing onions. I grew them for the first time this year so, there’s an abundance. I live in the humidity of Alabama where root cellars aren’t an option. I’m going to give this a go! Really like your blog! Thanks!! I’m having some technical difficulties and several posts have disapeared This tip works really well for not huge amounts of onions. Good luck!